Createspace Independent Publishing Platform, 9781477599976, 150pp. 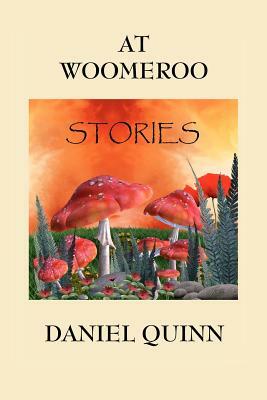 At Woomeroo is a land . . . where mirrors wink in the sunlight as people signal one another from the hilltops . . . where a squirming pink infant, babbling with excitement, arrives by mail . . . where a man turns his kite over to his small son, who is borne off by it over the hill . . . where a rooster says,"Oh good. Wonderful fine beautiful good. Really. Because now I'm going to kill you" . . . where between Tiffany's and Ferragamo stands Tetwilder's, a boutique dealing in designer children . . . where a king struggles to evade an inescapable curse . . . where, with the addition of a girl's packing crate, the boy's refrigerator carton becomes a commodious two-room hovel . . . where a digger finds all sorts of things in the ground, including an attractive young woman . . . where a top court confirms: No Civil Rights for Stomachs . . . where it gets to be time for visits, and the children from the workhouse come, weeping in their rags and sooty shoes, and everyone begins to feel much better . . . where a girl standing in the boundless sea shakes her head and asks with perfect innocence: "What is land?" . . . where as a captive in Japan, a U.S. State Department courier hones his skills playing table tennis with the unacknowledged son of the Emperor Hirohito. I grew up in Omaha, Nebraska, and studied at St. Louis University, the University of Vienna, and Loyola University of Chicago. I worked in publishing for twenty years before beginning work on the book for which I'm best known, Ishmael. This book was chosen from among more than 2000 international entrants to win the half-million dollar 1991 Turner Tomorrow competition for a novel offering "creative and positive solutions to global problems." The novel has subsequently sold more than a million copies in English, is available in some thirty languages, and has been used in high schools and colleges worldwide in courses as varied as philosophy, geography, ecology, archaeology, history, biology, zoology, anthropology, political science, economics, and sociology. Subsequent works include Providence, The Story of B, My Ishmael: A Sequel, Beyond Civilization (1999), After Dachau (2000), and The Holy (2002). I can be found on Facebook, and my Web site, ishmael.org, is enormous, offering news and announcements from readers, suggested readings, speeches and essays available nowhere else, detailed answers to more than 500 questions readers have asked me over the years, and a Guestbook with thousands of entries. I and his wife, Rennie, have lived in Chicago, Santa Fe and Madrid, New Mexico, and Austin, Texas. We currently reside in Houston.